In this day and age, fads come and go daily. I actually heard today that having Attention Deficit Disorder is now hip in Los Angeles, go figure. But in aviation, things take longer to develop and “grow legs” as they say. One of those concepts is the invention of the Light Sport Aircraft. 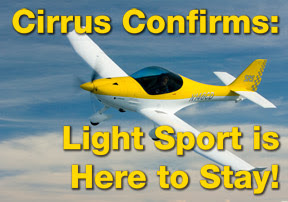 On Monday at EAA AirVenture, Cirrus Design announced a partnership with Fk Lightplanes of Speyer, Germany to produce the Cirrus SRS (or SR Sport) light sport aircraft. First deliveries are expected next summer. 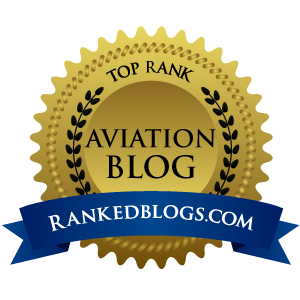 "For years we have talked about how we, as an industry, needed to introduce more people to flying," said Cirrus Chairman and CEO Alan Klapmeier. "The SRS is yet another example of [us] providing a high customer value product that is easier to fly, more comfortable, loaded with safety features – all at an extremely affordable cost." The SRS and Skycatcher are both at a price point that will allow just about anyone who can afford payments on an Escalade to begin flying. It is this vigorous new interest in Light Sport from some of the world's biggest names in GA that may in fact be the one thing that could turn around the decline in student starts we've all seen lately. "When Alan and I were kids, we'd ride our bicycles to the airport to see what planes were there. Now, there are no kids at the airport. We want to bring kids back to the airport." BINGO! Kids and airports...Hallelujah, someone at the top finally gets it! See, one of my personal peeves has been the increasing price of entry-level flying machines. Sure, the SR22, Columbia 400, Mooney Acclaim and Cessna 206 are all wonderful, fast, safe, high-tech hardware, but they are priced far away from what all but the seriously wealthy can ever hope to afford. It is this high initial buy-in that has helped to shrink our pilot roles. 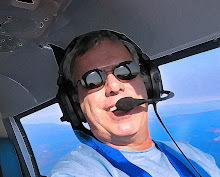 But with the new generation of brand name, high-quality, super-efficient and just plain beautiful Light Sport Aircraft from the likes of Cirrus and Cessna, Average Joe and Jane can no longer whine that the cost of new airplanes is out of their reach, keeping them out of the left seat. With these LSAs, dreams will again be attainable. More details about the Cirrus SRS will be released soon, as many of the final decisions about the plane are being decided as I type this. Rumors across the web today say the SRS could be closely related to the FL14 Polaris, which has some tasty specs that would need to be tweaked downward to meet LSA requirements. I want to close by saying this: I consider Cirrus Design to be the poster child for smart aircraft manufacturing. They do what they say and deliver the quality products they promised. If anyone has any doubt that the SRS will be anything but wildly successful, you will be in a very small group, because this airplane – and the C162 Skycatcher – are going to return general aviation to a day we all long for, when kids return to the airport fence, just to see what is flying.